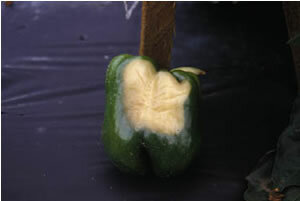 This is a non-pathogenic disease, which occurs in peppers and tomatoes. 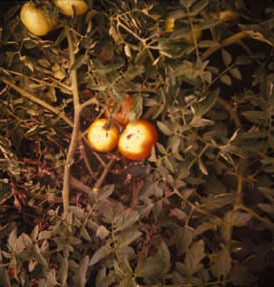 Sunburn occurs when fruits are exposed to too much sun particularly when the leaves were defoliated by insect pests or diseases. The affected areas are light-green (immature fruits)/ red (mature fruits) in color, and soft. Leaf “rugging” on tomatoes also increases sunburning. The affected areas later on become dry and sunken with a papery tan to white texture. Sometimes these areas act as avenues for fungal attack. Select tomato and pepper varieties, which are not prone to sunscald. Control leaf diseases and insects using recommended pesticides to minimize leaf loss.